Welcome to Music Friday when we bring you awesome songs with jewelry, gemstones or precious metals in the title or lyrics. Today, the sensational Ed Sheeran sings about how his struggling grandfather made a wedding ring from dental gold in his 2017 hit, "Nancy Mulligan." The song details the wartime love story of his grandparents and how their relationship flourished despite religious differences and the objections of their families. With the scene set during the Second World War, Sheeran recounts in his grandpa William Sheeran's voice how he fell in love with Nancy Mulligan at London's Guy's hospital. He was a struggling dentist and she was a nurse. Sheeran sings, "On the summer day when I proposed, I made that wedding ring from dentist gold / And I asked her father but her daddy said no / You can’t marry my daughter." "One was a Protestant from Belfast and [the other] was a Catholic from southern Ireland," Sheeran explained on the Beats 1 radio show. "They got engaged and no one turned up to the wedding." Sheeran, 26, noted that his grandparents were so poor that they had to borrow clothes for their wedding and that the gold for his grandmother's wedding ring came from a collection of gold teeth his grandfather had collected during dental surgeries. "[They] had this sort of Romeo and Juliet romance, which is like the most romantic thing. 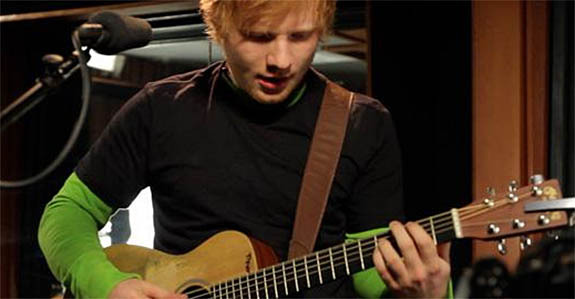 I thought I'd write a song about it and make it a jig," said Sheeran. The couple was married for more than 60 years and had a profound impact on their grandson's life. William passed away in 2013, but Nancy remains a big fan of her internationally famous grandson. "Nancy Mulligan" is part of the Deluxe Edition of Ed Sheeran's third studio album ÷ (pronounced Divide), and despite the fact that it wasn't officially released as a single, the song still managed to chart in 17 countries. Divide made its debut at #1 on the U.S. Billboard 200 chart. On the day of its release, the tracks from Divide achieved 56.73 million streams on Spotify. Please check out the official audio track of Sheeran’s “Nancy Mulligan,” which has been viewed 32.3 million times. The lyrics are below if you’d like to sing along. Written by Ed Sheeran, Benjamin Levin, Johnny Mcdaid, Foy Vance, Amy Wadge and Murray Cummings. Performed by Ed Sheeran. Four thousand light years away in the constellation of Serpens, a priceless planet five times the size of our Earth races around a tiny neutron star in an orbit that takes barely 130 minutes. Comprised mainly of carbon and oxygen, the planet is so incredibly dense that astronomers believe that the carbon has taken on a crystalline structure — and that means the entire planet could consist largely of diamond. The unnamed planet, which scientists describe as the dead core of a once-massive star, orbits a pulsar named PSR J1719-1438. Pulsars are fascinating because these tiny neutron stars spin hundreds of times per second, emitting beams of radiation that can be detected here on Earth. PSR J1719-1438 is just 12.4 miles in diameter, but has a mass that is 1.4 times as much as our Sun. 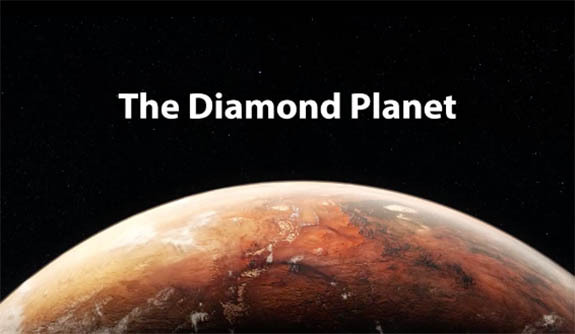 Matthew Bailes and his team at Swinburne University of Technology in Melbourne, Australia, first reported on the likelihood of a diamond planet in 2011. "The evolutionary history and amazing density of the planet all suggest it is comprised of carbon -- i.e. a massive diamond orbiting a neutron star every two hours in an orbit so tight it would fit inside our own Sun," said Bailes. 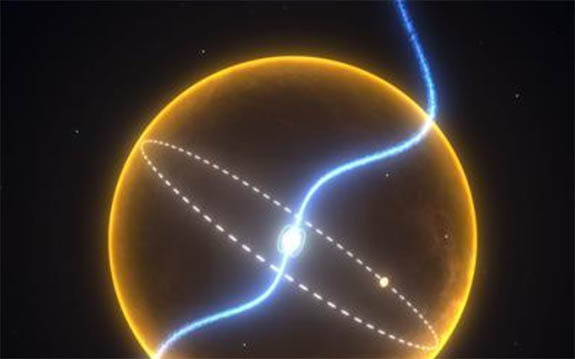 Although the diamond planet is not visible, astronomers can detect it when monitoring the pulsar. Beams from the pulsar are emitted in regular intervals, but are altered due to the gravitational pull of the planet, which is 3,000 times larger than the pulsar. PSR J1719-1438 and its companion diamond planet are located about one-eighth of the way toward the middle of the Milky Way, which spreads 100,000 light years in diameter. Although Bailes' diamond planet was the first to make headlines, Yale astrophysicists in 2012 theorized that super-Earth 55 Cancri e was also a diamond planet. Located 40 light years away, the carbon-based super-planet is about two times the size of Earth, eight times more dense and has a surface temperature of 3,900 degrees Fahrenheit. Credits: Images courtesy of Swinburne Astronomy Productions. 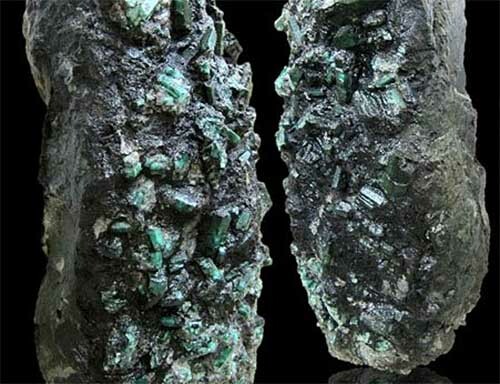 Standing nearly four feet tall and weighing more than a half ton, the world's largest emerald-embedded stone attracted impressive crowds last week at the Abu Dhabi International Jewellery & Watch Show. The priceless stone, which is 45 inches tall and 29 inches wide, is embedded with 130 emerald crystals weighing about 170,000 carats. During the opening of the international exhibition, Show Director Nehmat Fadel told the Khaleej Times that the surprise of the show was the emerald-embedded stone. "It was discovered 10 years ago in Brazil, and it's being displayed in the region for the first time," he said. In fact, this was the first time the mammoth stone had been seen outside of Brazil. The hexagonal emerald crystals exhibit a wide range of colors — from translucent and opaque variegated green to dark green. The largest of the crystals range from one-half inch to 9 inches in size. 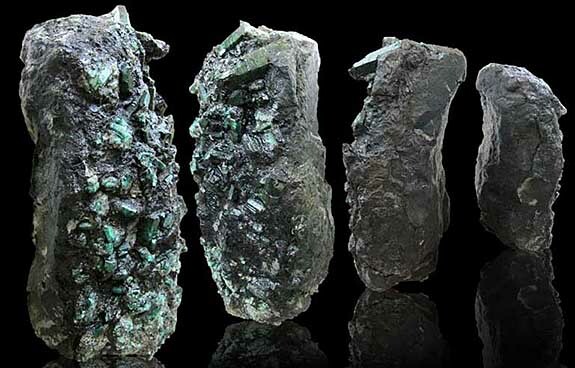 The emerald crystals are embedded in a metamorphic rock called mica schist. The host rock is made up of quartz and mica. "You got an entire mine full of emerald crystals embedded in just one piece and it's beautiful. It stands upright, is presentable and unique," noted John Martin, who represents the emerald attraction. Martin was hard-pressed to estimate how much the emeralds could be worth, stating that the only way to properly value the precious gems would be to extract the crystals from the host and study them individually. "Abu Dhabi is a special place to unveil the stone, as it is symbolic of the emirates," Martin said. "In 1971, when all the emirates came together, it impressed the world with its unity. Similarly, each crystal will have a value, but together it's much more powerful and beautiful. So, this is a stone that makes a statement for the emirates." Credits: Images courtesy of JWS Abu Dhabi.